Stan McQuay has a massive chest. 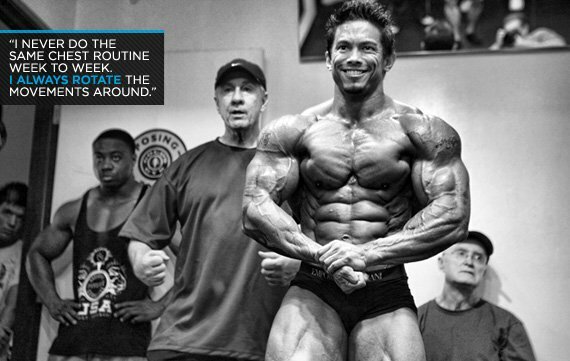 He built it with heavy weight and a solid routine of no-bull workouts. Chisel your own perfect pecs! Stan "the Man" McQuay has a powerful freaking chest. Sure, he's got huge pecs, but he's also got solid shape and density. If you're looking to build a chest so vast it makes your waist look small, you need to channel McQuay and do some heavy lifting. His chest workouts aren't fancy—there's no need for tricks—they're just effective. Do them for the next four weeks and see what happens. When you've finished, just rinse, repeat and grow. After it's warmed up, stretch your chest between each set. Get deep tissue work done on chest once per week to help open up the chest and create more growth. Use Infinite Labs BCAAs before, during and after each chest workout for maximum growth and recovery.